Last week as part of National Tree Day event we supplied local schools with seedlings, tree guards, and National Tree day t-shirts and gloves. We have been involved with Schools Tree Day for the past 9 years, supporting schools and the community in the Moreton Shire Region. It not only beautifies the schools and helps the environment, National Tree Day also encourages the environmental learning of the students. We had a number of Schools participating this year, one of them was the Good Shepherd Christian College at Albany Creek, a very lovely little school which has been participating for the last few year. This year it was their Prep classes which were involved with the planting. The classes were eager to get their hands dirty planting the seedlings and have enjoyed learning about the benefits of tree day in class. National Tree Day is celebrating it’s 20th Year this year, and is the initiative of the not for profit environmental foundation “Planet Ark”. It was created in 1996 to bring awareness to the Australian Community about the importance of planting native trees to protect and enhance our natural environment for our children and their children to come. 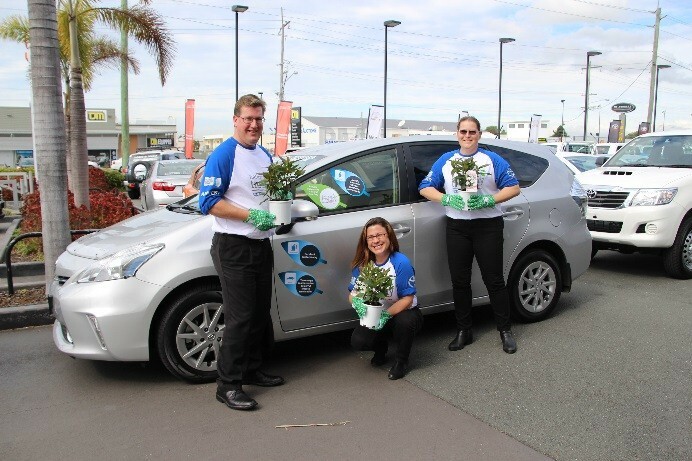 In 2000 Toyota became the principal partner and in that time National Tree Day has grown into the largest community based nature care activity in Australia. We would also like to thank Irene and her band of merry helpers out at the Plant Nursery Kumbartcho – Pine Rivers Community Nursery who provide us with the healthy seedlings each year.